On October 30, 1975, a twenty-three year-old teacher and coach from the exclusive Brunswick School in Greenwich, Connecticut, spent his first night in residence as a tutor for the Skakel family children. It was a job, and a night, which dramatically changed the course of Ken Littleton's life for the worse. Young, athletic, handsome, and a recent graduate from Williams, it seemed his future was full of nothing but promise. In the wake of Martha Moxley's murder, however, Ken Littleton fell victim to heavy substance abuse and extreme psychiatric problems. He was arrested in the summer of 1976, on Nantucket, for grand larceny, breaking and entering, and burglary. His criminal record would grow from that point to include shoplifting, assault and battery, and numerous DWI convictions. Within five years, he was working on a loading dock. 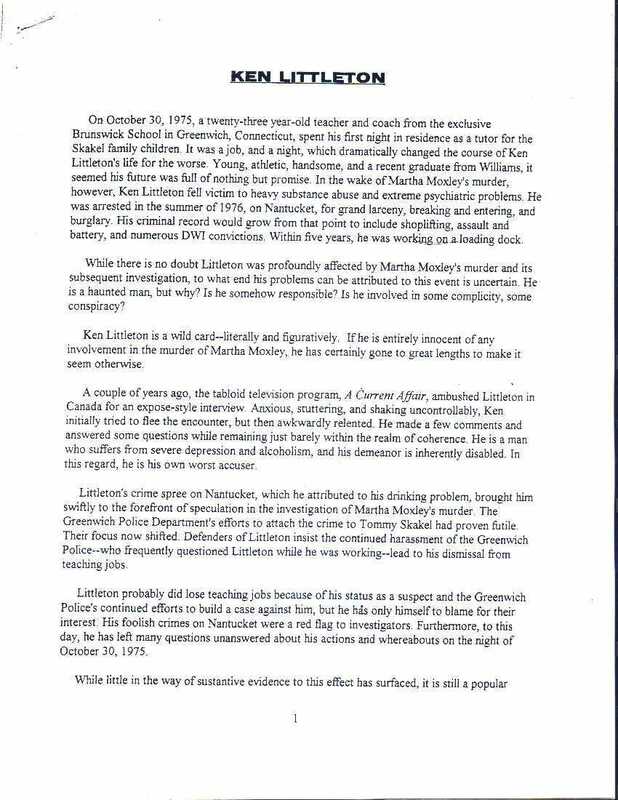 While there is no doubt Littleton was profoundly affected by Martha Moxley's murder and its subsequent investigation, to what end his problems can be attributed to this event is uncertain. He is a haunted man, but why? Is he somehow responsible? Is he involved in some complicity, some conspiracy? Ken Littleton is a wild card--literally and figuratively. If he is entirely innocent of any involvement in the murder of Martha Moxley, he has certainly gone to great lengths to make it seem otherwise. A couple of years ago, the tabloid television program, A Current Affair, ambushed Littleton in Canada for an expose-style interview. Anxious, stuttering, and shaking uncontrollably, Ken initially tried to flee the encounter, but then awkwardly relented. He made a few comments and answered some questions while remaining just barely within the realm of coherence. He is a man who suffers from severe depression and alcoholism, and his demeanor is inherently disabled. In this regard, he is his own worst accuser. Littleton's crime spree on Nantucket, which he attributed to his drinking problem, brought him swiftly to the forefront of speculation in the investigation of Martha Moxley's murder. The Greenwich Police Department's efforts to attach the crime to Tommy Skakel had proven futile. Their focus now shifted. Defenders of Littleton insist the continued harassment of the Greenwich Police--who frequently questioned Littleton while he was working--lead to his dismissal from teaching jobs. Littleton probably did lose teaching jobs because of his status as a suspect and the Greenwich Police's continued efforts to build a case against him, but he has only himself to blame for their interest. His foolish crimes on Nantucket were a red flag to investigators. Furthermore, to this day, he has left many questions unanswered about his actions and whereabouts on the night of October 30, 1975.